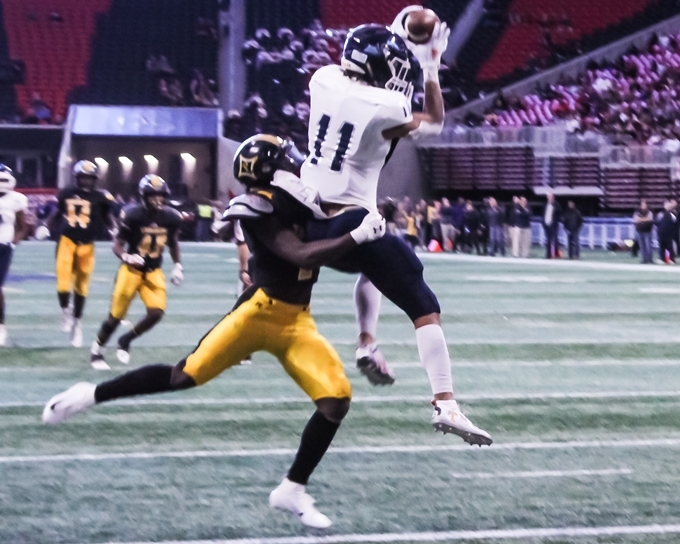 Kendall Boney connected with Jadon Haselwood on a post pattern pass for a touchdown with four seconds to play to rally the Cedar Grove Saints to a 14-13 Class 3A state championship victory over the Peach County Trojans at the Mercedes-Benz Stadium on Tuesday afternoon. “You have to keep coaching and fighting,” said Saints head coach Jimmy Smith. “We made a lot of mistakes and you have to credit Peach County for how hard they played on defense. The kids just kept fighting on defense until we could get something going on offense. Cedar Grove (14-1) was trailing 13-7 following a 30-yard field goal by Peach County’s Rene Galan with just 4:01 to play in the game. Then Haselwood who had punt return that was going for a touchdown called back on a penalty, struck for a big 58-yard kickoff return to set the Saints up with a first and 10 at the Peach County 37. Robert Jones got loose for a 19-yard gain to the Trojans’ seven to set the Saints with a first goal. Then the Saints had three false start penalties and were facing a third down and 22 with 10 seconds to play. 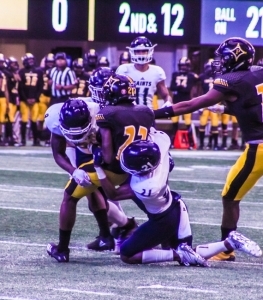 Boney dropped back on the play and threw a bullet to Haselwood cutting in front of a defender at the goal line for the game-tying touchdown with just four seconds to play. Luis Dominguez hit the game-winning PAT and the Saints were just four seconds away from their second state title in three years. Peach County’s Justin Harris fielded the kickoff at the five and went up the right sideline where he was run out of bounds after the clock had wound down to zero sending the Saints on to the field to celebrate. Peach County (12-3) took a 3-0 lead into half as Galan hit a 48-yard field goal with 1:43 left in the first half as the Saints put the stop on a 12-play drive, 51-yard drive by the Trojans. Peach County’s second possession of the half ended in a punt and Cedar Grove had good field position at their own 47. It would take just two plays for the Saints to get into the end zone. Boney tossed a 41-yard pass to a leaping Montre Montfort down to the Peach County 12. The next play Boney took off on a draw and bulled his way into the end zone for the 12-yard scoring run. Dominquez hit the PAT for a 7-3 Saints lead. Peach County answered as Noah Whittington finished off a 12-play, 70-yard drive with a two-yard run with 16 seconds left in the third quarter as the Trojans regained the lead at 10-7. Peach County forced the Saints to punt from their own five-yard line and got the football on Cedar Grove’s 30 to start with great field position. A 23-yard pass from Jaydon Gibson to Terkel Jefferson had the Trojans threatening at the Cedar Grove seven with a first and goal. An illegal substitution penalty and the Saints’ defense getting to tackles in the backfield forced the field goal by Galan that put the Trojans up 13-7. The state title was Cedar Grove’s second to go with its 2016 title and gives DeKalb County Schools their 14th overall. Cedar Grove’s Jimmy Smith now has two football state titles while also having won four consecutive (2015-2018) state championships in Class 3A track. His career record at Cedar Grove in six seasons is 67-14-1 and 18-4 in the playoffs. Jadon Haselwood finishes his career with 153 receptions for 2,872 yards and 44 touchdowns. He also has 11 total touchdowns on special teams and defense. Haselwood also changed from his No. 2 jersey to No. 11 to honor former teammate Trevon Richardson who graduated a year ago and was killed in a shooting last May. 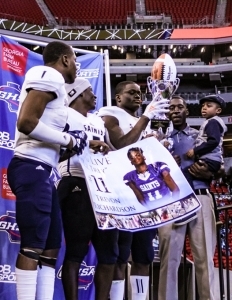 The team dedicated the game to Trevon and had a poster with them on the trophy podium.